[June 11, 2019] Business and Finance for Technical Personnel | The Drake Group, Inc. 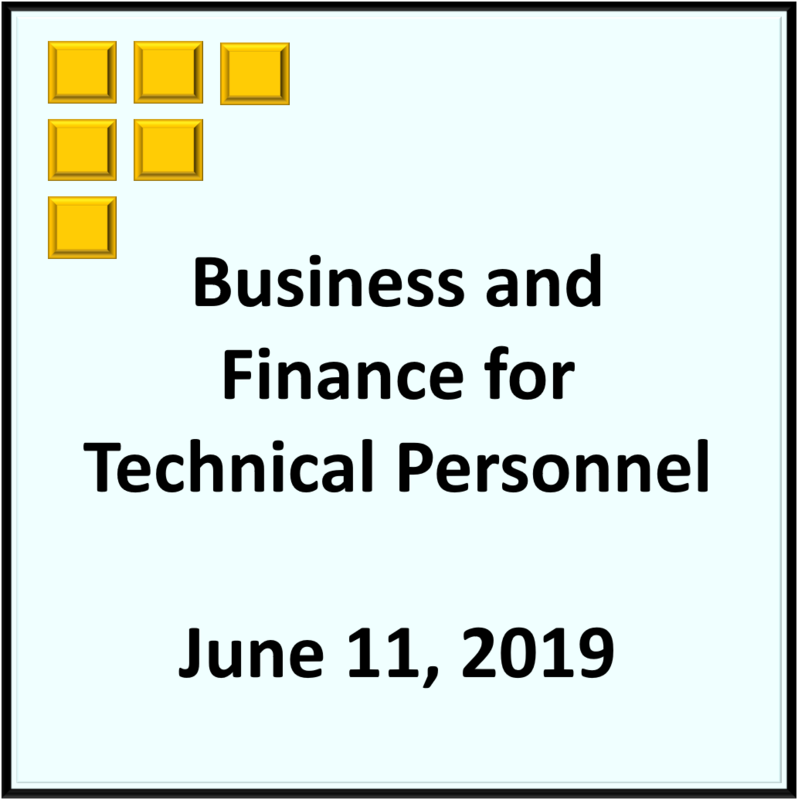 This is a one-day seminar that is structured for a technical person that needs an exposure to aspects of the business world. This seminar is not intended to teach someone how to be an accountant, but rather, expose a technical person to business terms and concepts. The following subjects are briefly but concisely discussed. Rest easy… We only spend 5 minutes on these Things! The forerunners of corporations were proprietorship and partnerships. We will look at their pro’s and con’s. The days of Thomas Edison inventions are in the past. Today most accomplishments are done through corporations. We will learn that a corporation is a powerful legal entity. “Why does everyone want to keep The Board happy and what is their job anyway?” There are good reasons and we learn what their jobs are. With so many stockholders owning the corporation, who is really steering the ship anyway! We learn how the course of a corporation is set. The word “versus” makes it sound like a football game between Team Debt and Team Equity. Well… it is kind of like a football game where we watch the score very closely and we will learn why. “Venture” sounds like an action packed “adventure movie” and sometimes it is. We examine how venture capital funds many projects and new corporations. If we are fortunate enough to make a profit in our corporation, why don’t we take all the profit as dividends and have a big party! Well if we did that our company would never grow. We learn why we must share. This is not a face-lift for the capital building but a way of buying new facilities and equipment… and it is usually treated differently in budgeting and at the end of the year. “An income statement seems to make sense… but what in the heck is a balance sheet!” We will learn how to look at these and determine many things about a corporation. General Electric… General Washington… and General Ledgers… The accountants always refer to “him” with great respect and we will learn why. “All those finance guys are just accountants… right?”… Wrong! We need to understand the difference and the responsibilities of treasurers, controllers, CFOs, etc. “I have always appreciated persons with direct personalities. But now you say a direct personality came be an indirect person at work! You are trying to trick me!” We will learn the specific differences. “Whatever exempt people have… non-exempt people must not have.” We will learn what the law has to say about that and how it affects you. “I am a young engineer earning $25 per hour and the company is billing me out at $80 per hour. The company is getting rich on me!” We will learn what is in overhead and where that other $55 went. It costs a lot of money to have employees… more than just what you pay them. We will find out what all those letters above mean. “There is an endless supply of money to fund our wonderful engineering project… right?” Wrong! The name of the game is cash flow and we learn how budgets play a big part. Terms and Conditions are in the fine print on the back of the contract that tests our eyesight. We learn the important Ts & Cs for when we are the buyer versus when we are the seller. We are not splitting hairs when we want to use the correct word in the correct context. “If a company buys a car and depreciates it over 5 years… that means it’s really free… right?”… Wrong! We learn how depreciation is handled at the end of the year. Plans sound like architect’s blueprints… and in a way a business plan is just that. We learn what “things” are in a basic business plan.